There are so many great granola variations out there, but my favourites are those that replace all or part of the oil with a fruit/vegetable puree. 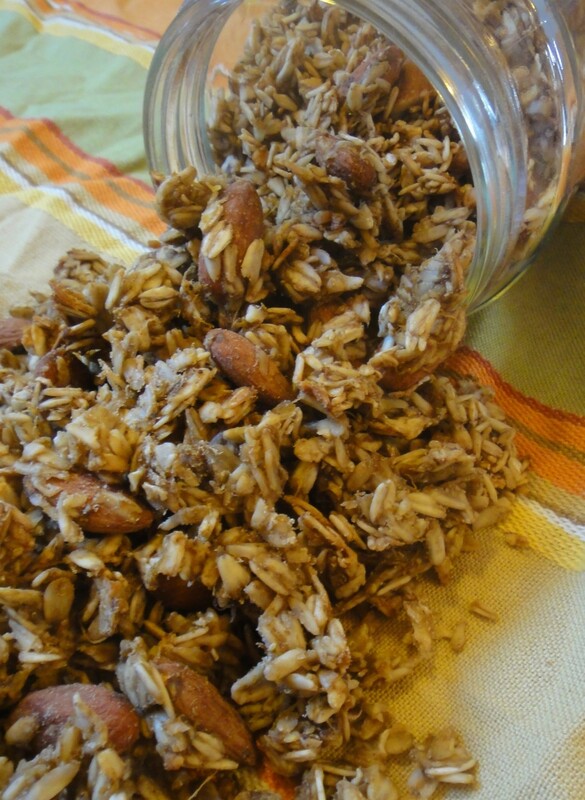 The result is a bit softer and chewier than a traditional granola, and you get great clusters of oats without adding extra sweeteners to stick everything together! Combine the tea base ingredients in a small pot and simmer until reduced to half. Add the pumpkin puree, maple syrup, honey and spices. Pour pumpkin/chai mixture over the oats and stir to combine. Bake for 60 minutes, or until mixture is dry and browning throughout, stirring every 15 minutes. Add 1½ cup almonds in the last 15 minutes of cooking. Let granola cool completely in the pan. Leave undisturbed if you prefer large granola clusters, or stir occasionally as it cools if you prefer a consistent texture. Transfer to a sealed container for storage.